Hi all . Does anyone know of any rules for building pontoon bridges in a game . I'm using Black powder or Sharp practice . I'm thinking along the lines of a bridging party surprised by cavalry ,reinforcements arriving from both sides but still building the bridge. Any thoughts .??? Even Empire the rules are vague. I suppose your to figure time needed and go from there. Did it once in a game. Don't know how wide your river but just say it takes 4 turns to complete, no work if engaged. Maybe die roll if work is a full turns worth or 1/2 turns worth. Well covered by Charles Grants scenario books. Dunno about rules but they did take HOURS to build. Depends what sort of time frame your game uses…. …and Charles Grant's The Wargame Rules. One way they were set up was to build them on your side of the water, along the bank, and then let the flow swing them out into position before tying them off. It might be easier to justify this form of construction during a battle in progress. I think the way to rationalise this is to just decide that the bridge is x turns from ready. If a turn is ten minutes you're saying that it's half an hour from being ready. If you then decide for aesthetic purposes to add a pontoon per turn to signify that, then fine. That it really would have taken three hours or whatever is neither here nor there. You're using the pontoons to represent progress. The building of a bridge from scratch would not be practicable in most games but the finishing touches can always be justified for your scenario. The 'progress when unmolested, none when under enemy attack' approach seems sensible. A dice roll would add a level of unpredictability too, which you may or may not want. A quick question. How often were bridging trains actual used? I don't include 1812 retreat from Russia because those where not bridging trains. I think the Austrians had some early in 1809 and from what I've read, Napoleon wished he had one in 1814. I believe the British built some in 1811 before Albuera when they were getting into position for the first siege of Badajoz. Last time I ran a game featuring a pontoon I had it built "at the speed of plot" – in other words what would make a good game. Granted it wasn't a wide river I allowed it to be done in about an hour. Bill. 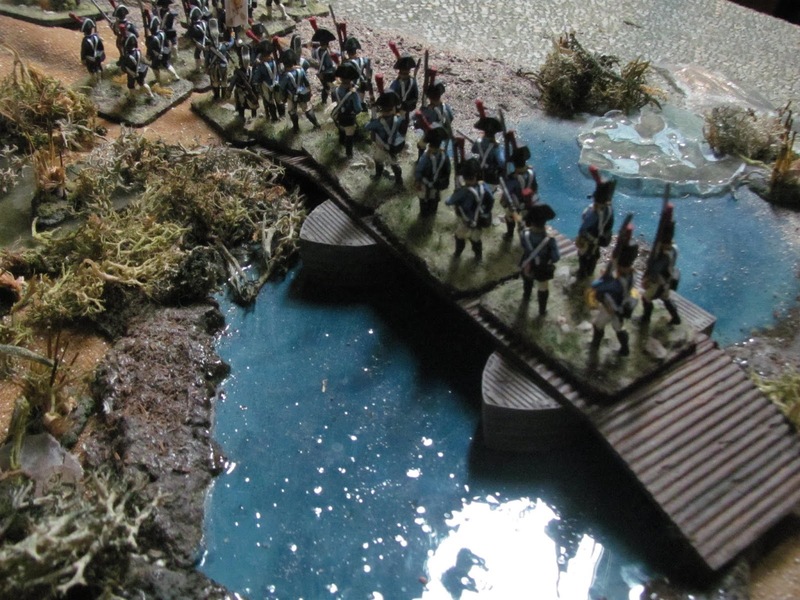 Love the use of the Airfix pontoon bridge boats. Here is a pontoon bridge game for an earlier period but the system and materials were the same.